Can’t bake a cake to save your life? Relax, help is available. The mouth-watering Red Velvet Cake by Sweet Street Desserts seen above might not be available at your local supermarket, but you can order it online (from Barnes & Noble, no less!) and tell everyone you baked it yourself. Don’t worry, when it comes to sweets, it’s OK to cheat! 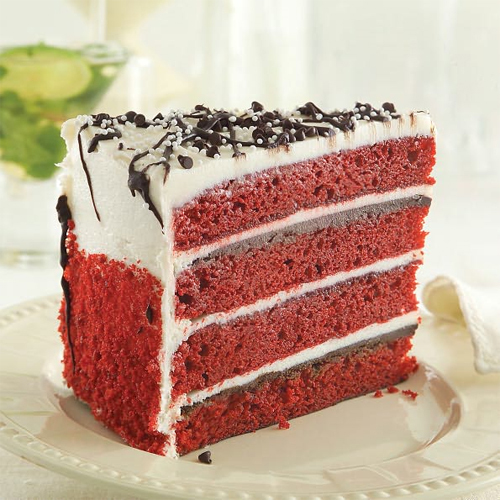 Brilliant red velvet cake layers, stacked four high, are spread with deep chocolate truffle filling, then filled and frosted with tangy cream cheese icing. This luscious dessert is baked from scratch and then frozen for perfection. You will always serve something exceptional when you offer Sweet Street Desserts. For over 30 years Sweet Street has been dedicated to making luscious desserts that excite the palate and satisfy the soul. Featured on the Food Network and served in the finest venues – from the White House to the GRAMMY Awards – their desserts are selected when professional chefs want to delight their customers.